Mainsite -> concretesubmarine.com/ FORUM -> Ocean colonization how to get there -> Seabreaks for dampening colossal ocean waves? TOPIC: Seabreaks for dampening colossal ocean waves? Seabreaks for dampening colossal ocean waves? I imagine that if wave breaks are built in a large circle on the ocean surface, then the interior concrete structures don't need to be so robust. 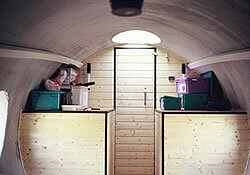 This could save a lot of money, and create a more tranquil place to live. 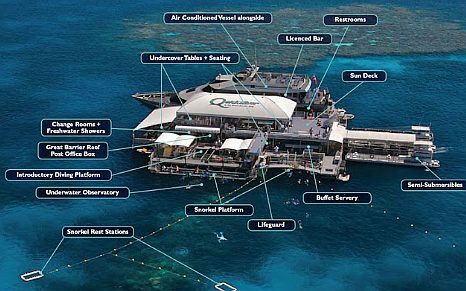 I think if the seabreak was built, then quite a few sea steaders (and yachters) would come out of the woodwork to inhabit it. Similar to 'if you build it, they will come'. People would purchase their own seasteading dwelling and ship it to the location, I think. In short, a seasteading community can be jump started by a seasteading developer by making a safe and secure seabreak somewhere out in the ocean. Are there any designs for deep sea seabreaks on this site? No, not an underwater break. I mean a surface break, that can protect the interior from large waves. In fact exactly this is what the devolpers of Palm Dubai had in mind - a artificial lagoon. 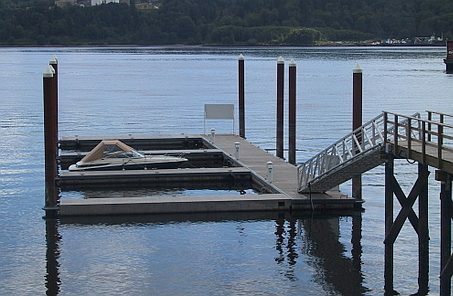 The underlaying problem with a floating breakwater is that it should dampen all ocean waves. 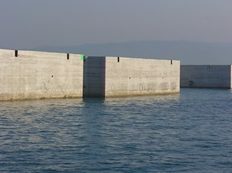 As ocean waves can have wavelenght of more than 100m and you need a structure that is several times wavelenght size to get the desired complete calm lagoon even a small version of a breakwater lagoon needs hundred(s) of meter of structure. So that is no small scale project. Basicly to get the wave breaking effect of a reef you need to build a reef - and that is a major building volume. The Monaco breakwater has done this successfully. Another example is the breakwater of the ekofisk oil storage tank. 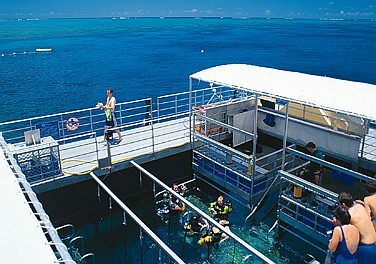 If you have seen the film waterworld you remember probably the lagoon set - this was actually a floating ring lagoon that was set up in 6 segments in Hawaii . 'Artifiical lagoon' led me to search Google for more examples in addition to the one you mentioned. Fantastic photos, thank you for posting those. To continue with my main thought, I think the focus on the size/shape of the living areas is not the proper way forward. The outer sea break is the way forward. My personal study of free-markets has convinced me that when people are allowed to own property and are able to invest in free-markets then companies come up with amazingly creative and diverse ideas. This free-market innovation is something you can basically predict occuring, although you can't tell what it will look like. If a sea break were constructed which (1) could repel 100' wave and (2) enclosed an area the size of a small village, then I would anticipate that free-market innovation would advance very quickly. The interior surface area of the sea break circle would be filled by an amazing assortment of habitable units. Do they need to look the same? No, of course not. Some inhabitants will want a modest sized dwelling, and some will want a floating palace. Some will want a concrete structure, some will prefer aluminum. Etc. It's not up to us to figure out what to build, let inhabitants create and hire companies to do this thinking and building for us. In short, there isn't a real need to determine what is the 'best' living platform for living on the ocean--the free-market will do that for us. All that is needed is create an area and invite individuals from around the world to populate it. I agree completly - if people ask me how a "seastead" will look like i would say that whatever the owner wants it to look. Current commercial models are known as yachts, houseboats, but unconvential models like totora islands in lake titicaca and richi sowas bottle island also can be seen as early seastead models. No need to come up with a "fit for all concept". 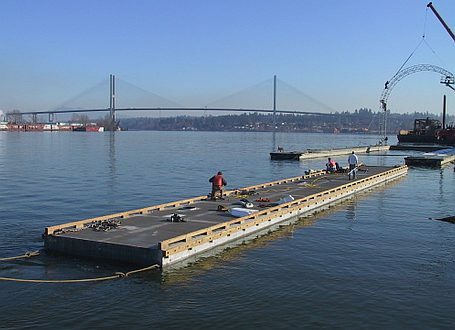 I agree with you that if you take out the wave hazard in a sea area by enclosing it in a floating breakwater you enable basicly anything that floats for seasteading. 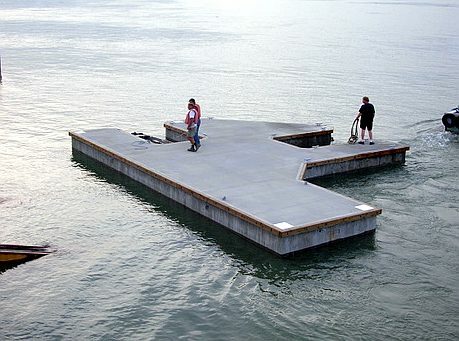 Well, not convinced a breakwater would require so much work to create. That doesn't look obscenely expensive to me. I will need to spend some time reading those threads. The base question is how can i stabilize a cubic meter of living space in open sea to create a acceptable permanent living comfort at a minimum cost - and i would say floating breakwaters may not be the most economic and easiest to build answer. They work well on a mega scale for oceanic cities - but the required building volume is just too much for a small scale start up. What if you started small, with a 50' diameter circle, or about 160' perimeter wave break? 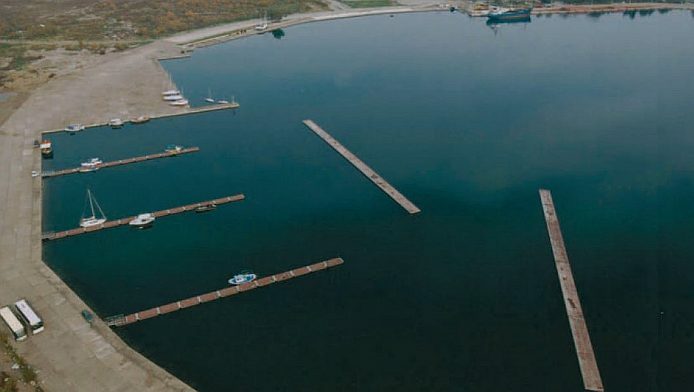 segmented breakwaters seem to be the most feasible approach - it would allow a seastead to start in a protected bay - prosper in a low wave ambient - and as economic power grows acumulate breakwater elements over time to migrate and expand out to more open water with harsher wave ambients. A breakwater needs not necessaryly to be a rigid structure, as the example of ice fields, kelp fields, and mangroves show even small pieces if present in big number can create an important wave dampening effect. Starting small with breakwaters is difficult as a small floating breakwater would just ride the waves like a ship and not dampen the big oceanic waves sufficiently to create a comfort zone. The kind of breakwater you see in the picture above will dampen small and steep waves created by boat traffic in a bay quite nicley but it will have as good as cero effect on a Draupner Wave, or the big oceanic waves that can break a container ship in pieces as you see them here in the videos. This ship exceeds 100 m in size - it still moves in the waves quite a bit - to have a breakwater create a "safe zone" in that conditions its size must be considerably bigger than the waves. A breakwater of less size than the waves simply starts to move with the waves .... this is called "tracking waves". 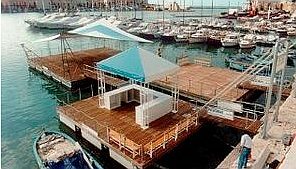 To be protected from that kind of waves you either must float in the calm water created by a (natural or artificial) structure that is a mile long, you must put your living space suspendended 30m in the air on stilts (oil platform) - or you must create your living space a few meters below the surface. So the question is - what is the most economic way to get protected? 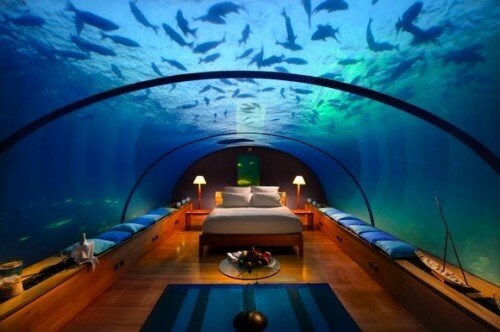 "To be protected from that kind of waves you either must float in the calm water created by a (natural or artificial) structure that is a mile long, you must put your living space suspendended 30m in the air on stilts (oil platform) - or you must create your living space a few meters below the surface." Ah, I understand what you are saying. 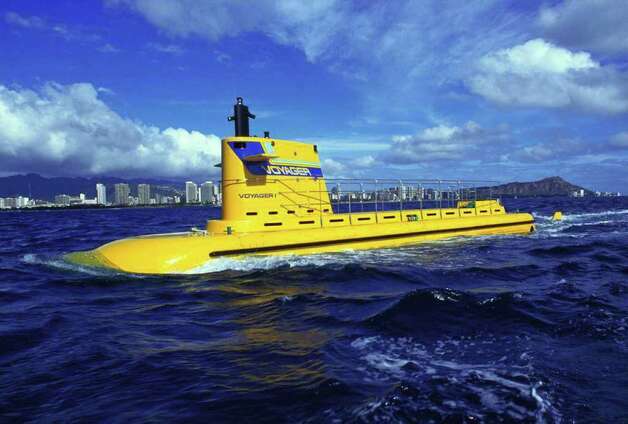 It may be prohibitively expensive to rely on seabreakers to dissipate those huge waves. 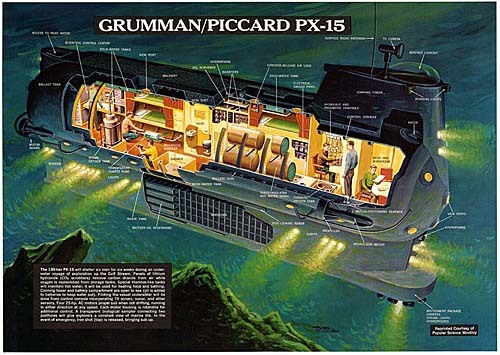 I agree, it would probably costmillions of dollars to make a seabreak that can protect a stead against a Draupner Wave, and it might even end up being cheaper to built an elevated platform, or a sub-surface stead. 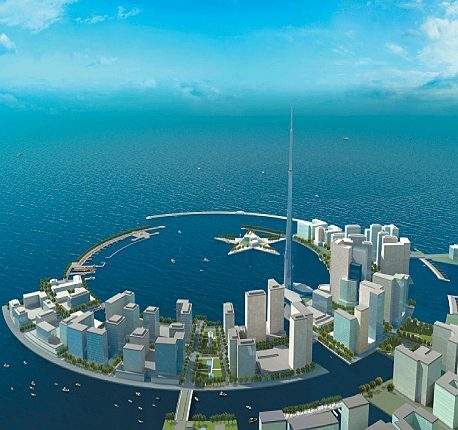 No doubth if we could get a start up as big as the male lagoon or as big as Palm Dubai protecting that floating city with a artificial breakwater would be the first choice. The problem is that nobody can come up with the funds to develop such a site and scaling it down until it fits to available budgets is not possible due to the charackter of oceanic waves. So we need to look for solutions that are available for smaller budgets - and what comes to mind is avoinding waves by going below the water surface. I tried to present that concept on the TSI forums - in the open ocean capeable living space bubble thread - unfortunatly the forums there suffer a lot of sidetracking so you must be pacient enough to read it all and filter out the value info. 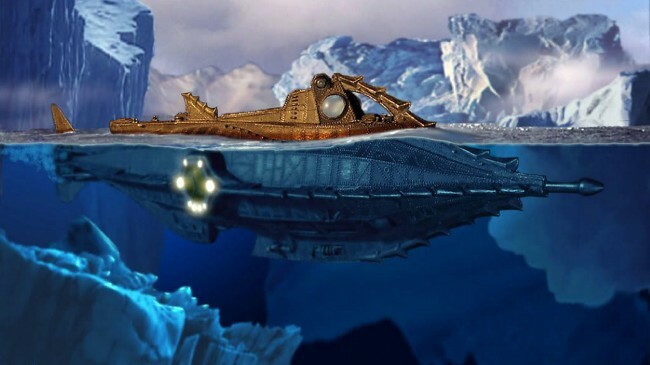 Another concept that goes below is the Captain nemo float out but i would not really dismiss surface floating concepts for seasteads - on contrary i see them among the axes ocean colonization will develop. A concept that also goes in that direction and allows a scale up from a very small start up to a gigantic city sized floating island is the Ramform Harbor it combines the quality of a ship with the qualities of a marina or a industrial harbor installation. It also brings in a quality that has been described as modular floating island - something that starts very small and grows over time. Interesting, a Ramform harbor, I've never heard that term before. 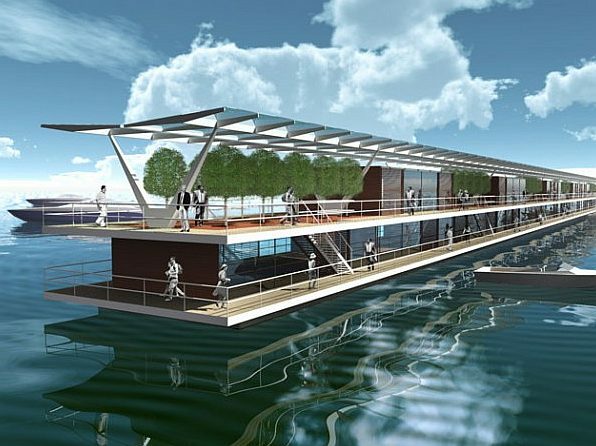 There is so many amazing ideas for Seasteading. I wish things would progress faster, though. Ramform ships are relative new as a concept they started with a series of oceaographic survey ships with need to access the ocean and to tow gear in a much better way from a stable platform. (picture below Ramform Banff) but the Idea has also been comming up for yacht concepts like the WHY yacht, and has be implemented for oil/gas production platforms like the Ramform Banff. 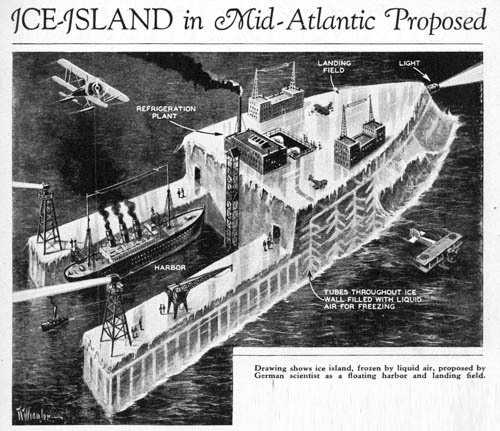 In WW2 a Ice Island that would work as harbor and aircraft carrier in mid atlantic was proposed with that form. Finally inflatable boats have that form- so it is not really that new. 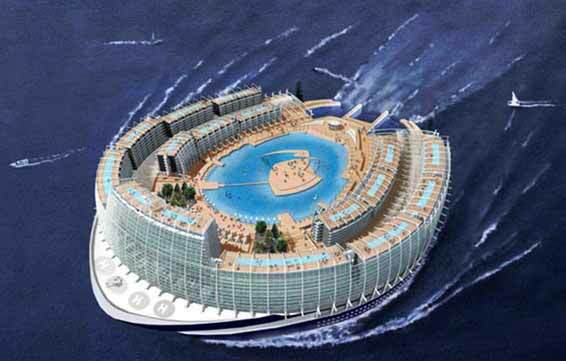 For seasteading a build along the lines of this concepts just in ramform would work fine. 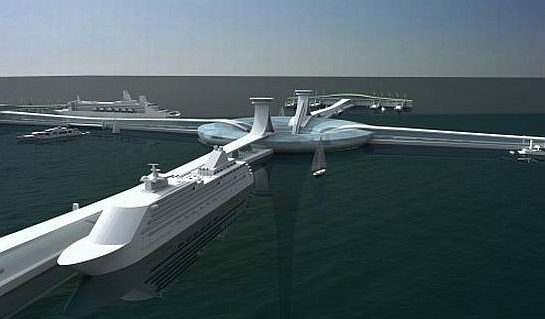 The ramform seastead allows to have a ship bow capable to deal with big waves combined with a neat calm water space in the stern section and keep the concept still mobile like a ship, while allowing ongoing modular building and growth in the stern section compareable to the modular island concept. So it gets together pretty much of the best of most of the proposed seasteading concepts. Interesting, have you read those? I would say that i have read almost all studies and books written about the theme of floating concrete structures. In fluid dynamics, wave shoaling is the effect by which surface waves entering shallower water increase in wave height (which is about twice the amplitude). It is caused by the fact that the group velocity, which is also the wave-energy transport velocity, decreases with the reduction of water depth. Under stationary conditions, this decrease in transport speed must be compensated by an increase in energy density in order to maintain a constant energy flux. Shoaling waves will also exhibit a reduction in wavelength while the frequency remains constant. In shallow water and parallel depth contours, non-breaking waves will increase in wave height as the wave packet enters shallower water. This is particularly evident for tsunamis as they wax in height when approaching a coastline, with devastating results. Interesting--but how can wave shoaling be used to help seasteading? If the depth to the ocean bottom doesn't change drastically, then how would the wave heights change? Are you thinking of creating an artificial ocean bottom in order to limit the wave heights? Pie, on a mega scale there is a lot of things you could do for creating a breakwater lagoon - natural reefs are doing exactly that. They are submerged but they will not let pass big waves. The problem stays the same. To build something that interacts with big ocean waves no matter what the shape or nature of the building is - the amount of building material is always enormous - we are talking of many thousands of tons - so there is no way to start it small scale. The smallest size for a shipstead that gives a reasonable comfort level in most seastates is the Ramform Banff. 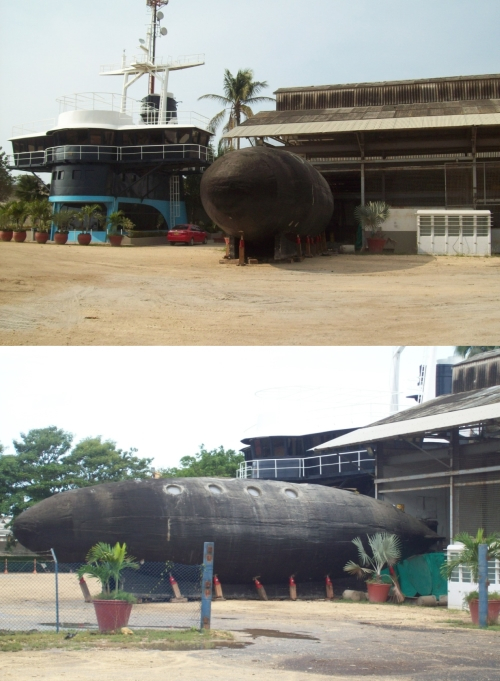 It was built for being stationary at sea and work as as stationary load terminal. The wide beam avoids rolling movements - the ship bow allows a reasonable wave handling. The broad stern a calm water docking area. A cube of water 1m size weights 1 ton - how many thousand tons of water do you see on this video in movement ? The surfer will only live because he is not hit by this force - either he ducks under it and takes it submerged - or he surfs it out. More about Monster Waves and strategies how to handle them read here..
Wow, that wave is incredible. Although I imagine there are freak waves that are twice as big. The general setup of that video - a surfer with his jet sky tow partner, a helicopter in the air filming it - suggests that this is just a normal surf day with outstanding conditions - nothing near the real freak size encountered by the ships Caledonian Star and Bremen in the Antarctic ocean. According to the Captain of the Caledonian Star this wave was so big that it made the ship surfing down in a 45 degree angle in a hole that opened just before the crest. 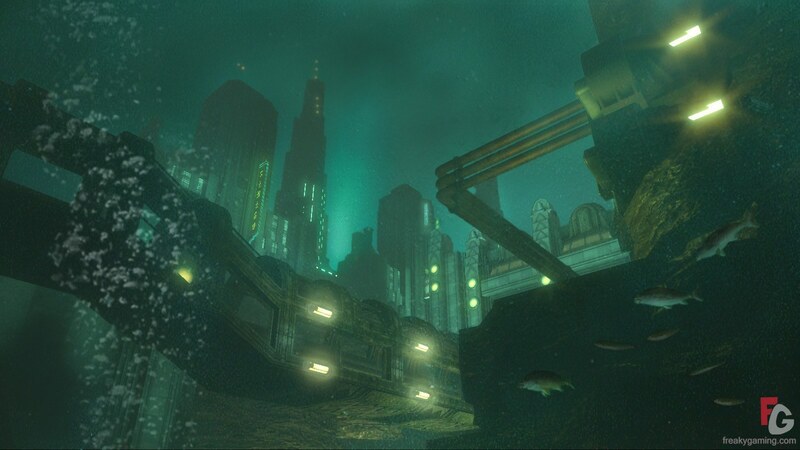 When he was in the valley he could not even see the wavecrest from the bridge of his ship - so high was that monster. read here.. The good news is that a ship taking such a wave over the bow although taking some damage can survive. The "Caledonian Star" and the "Bremen" both survived taking the impact over the bow. So we should have a bow as a safety feature on a seastead. A Ramform would be up to the task. A ramform is excellent when the wave is coming directly to bow. But what happens if it hits the stern? Can the ramform be spun around 180 deg in time for any of these monster waves? 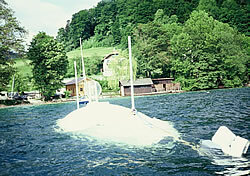 A ramform would stay with the bow in wind and wave direction when moored and therefore have no engine need nor need to spin around ... a wavehit somewhere else than the bow is very unlikley. This is not the case in a ship as the ships course depend on a transport shedule and can cross wind/wave direction. FPSO and FSO systems today have become the primary method for many offshore oil and gas producing regions around the world. An FPSO (Floating Production Storage and Offloading) is a floating production system that receives fluids (crude oil, water and a host of other things) from a subsea reservoir. 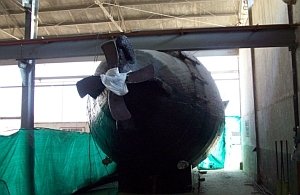 Most FPSOs are ship-shaped and are 'anchored' (moored) by a turret. 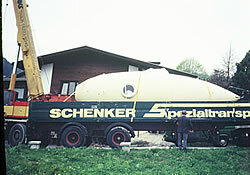 The type of turret used is determined by the environment of the FPSO. In calmer waters spread mooring is often sufficient. 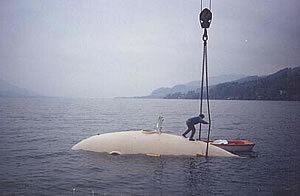 In environments where cyclones or hurricanes occur disconnectable mooring systems are used so that the vessel can be taken out of the storm's way and replaced when the storm has passed. Very interesting, a turret mooring system. So, large waves really only come from one direction at any given time? I understand now why a turret ramform is such an efficient design. Large waves are brought up by the global wind sistems which basicly never change direction at least not in a timeframe of hours or days - maybe seasonal - a sudden wind and wave direction change offshore would be a almost impossible event. 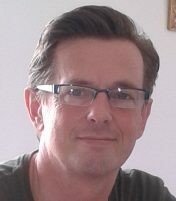 When changes happen it will be very gradual and allow the structure to follow the change. The building up of big waves needs time - much more time than the structure will need to turn around to point into the new wind direction. Freak waves stick out due to their SIZE that can be several times higher and steeper than all the other waves - but they do not come from a different direction. Tsunami waves built up by seismic events are completly inperceptibe in open water due to their big wavelength so they would not damage the structure no matter from what direction they come. or, build a single very large ramform platform with a single turret-moor? 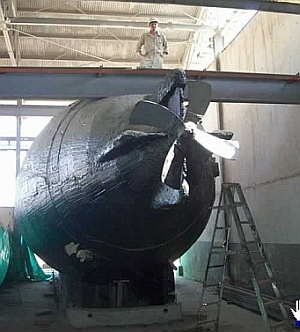 What do you think the minimum size of a ramform vessel would need to be to be permanently located at, for example, Saya de Malha Bank near East Africa? I would not use the term seasteading as it was geared to a political dimension that has nothing to do with the technical challange of ocean colonization. I am not interested in politics. 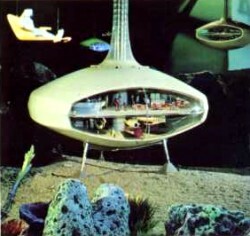 So lets talk about ocean colonization. The platform size is not driven by a choice of options but by project budgets available. It is not feasible to build something city sized in a single project. Even Palm Dubai was split in smaller sandbanks sold to different owners in the sense of a real estate development. So the option to build a very large ramform that exceeds Ramform Banff which has the world biggest finance muscle (oil/gas) is just not on the table - exept in phantasy land. It might be that you can start with a small ramform and make it grow in size just the way land cities grow. They start with 5 trailers in the outback and become a city two centuries later. 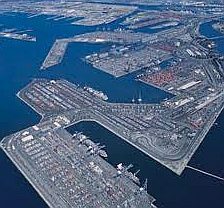 Like a land based city is a "loose accumulation of housing units", a sea based city will be a loose accumulation of housing units too. The size of the housing units (apartments) is not driven by the owners choice it its driven by the owners financial means. 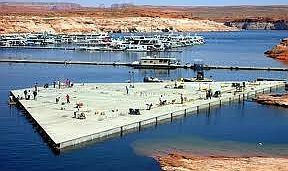 Using concrete shell and honeycomb structures (just as we do on land to house people) we will get more or less the same cost per squaremeter for floating housing developments as we have for land based housing developments. The size of the average base unit will be compareable too - it will be "apartment size". Like on land there will be independent units (houses) in the suburbs and accumulated units (a couple of dozends) in a building in the settlement centers - the maximum size of those accumulations will be the size of a building or its aquatic equivalent a cruiseship. Bigger units will have difficulties to sell to the housing market due to the same practical problems in the "condo administration" that we experiment in land settlements too. The way several units will be linked together will not be very different from how oil platforms work in close proximity without colliding - the base solution will be tendon anchors and spread moorings. 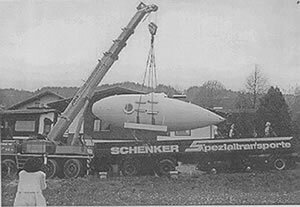 We will also see "train like" configurations sharing a single mooring. Like in todays oil/gas industry the mooring cost is only 10% of the project cost . 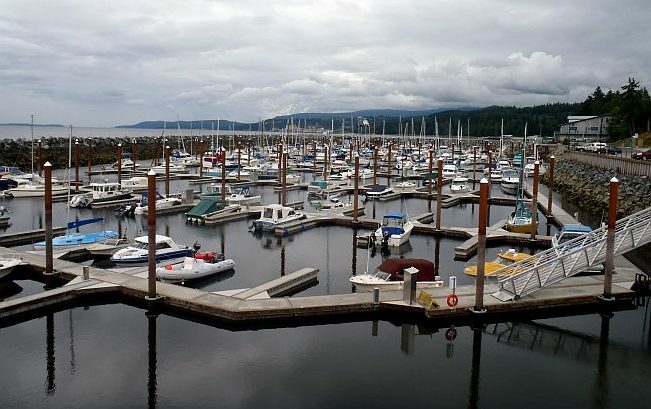 We will see single family units in protected waterspaces first - we see them already - as houseboats, and yachts. 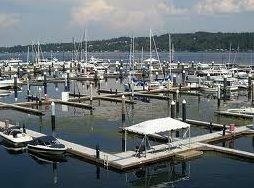 This will grow gradually out of the bays to more open water as prices per housing unit come down from millionair toy segment to general public. Key to come to this price reduction is a go away from resin and carbon fiber for yacht look to concrete and normal housing look and cost. 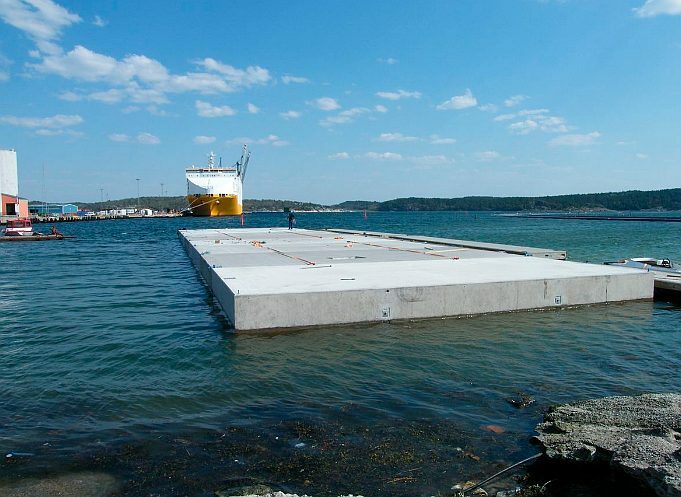 The experience with Ramform Banff and similar structures shows that a surface float can only stand allone in open ocean and maintain a housing comfort level when it exceeds 100m in size. This minimum size requirement is a problem for a single family unit. 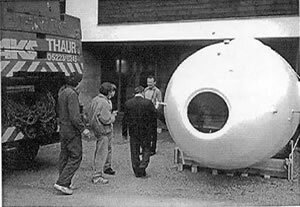 So smaller single family units may go for submerged to circumnvigate the size requirement in the sense of the "bubble housing unit" or the globally mobile "captain nemo float out". For adventure minded individuals small ramforms the size of Kon Tiki can be used to cross an ocean - but draupner events will stay a safety risk for such a small sized platforms in open ocean. The minimum size for a permanent human settlement in a desertic spot in the middle of nowhere (Saya de Malha Bank) is probably best expressed by the development of LAS VEGAS it was first built on maf money on purpose in the middle of nowhere in the desert - then grew to polulation center size and now creates its own business ambient and livng quality, a spot of population gravity independet of its (non existing) surrounding. 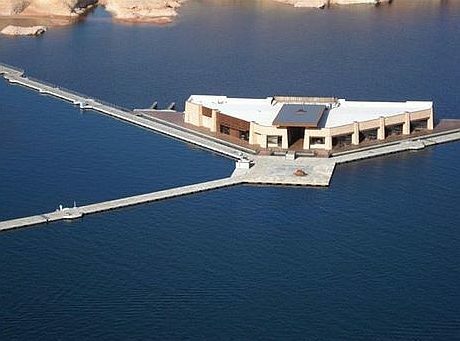 It is feed by money that flys in, by water and electricity that comes from the hoover dam. 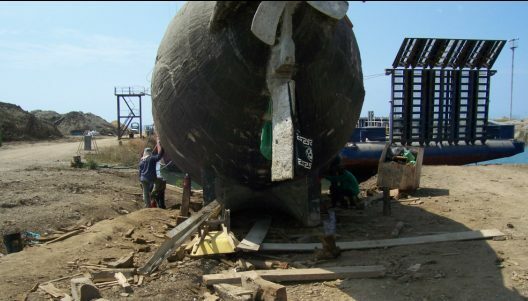 For a semi-permanent settlement based on aquaculture - the size, work, and business model, of a fishing factory ship will probably apply to Saya de Malha. Settlement is always driven by the business model - agriculture settlement, mining settlement, tourism development. 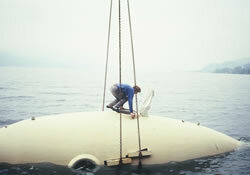 The whole idea to settle on a seamount to reduce mooring cost is a bad one - you save 3% of the project cost for "having a shorter anchor line" but you cut yourself from all possible business options due to a impossible location - a really bad trade - compared to floating in a bay near a city center. 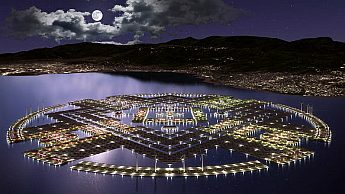 The simple business of creating real estate squaremeters where there have been non - will create a sufficient income to power the development of a floating city extention near a shoreside city center. 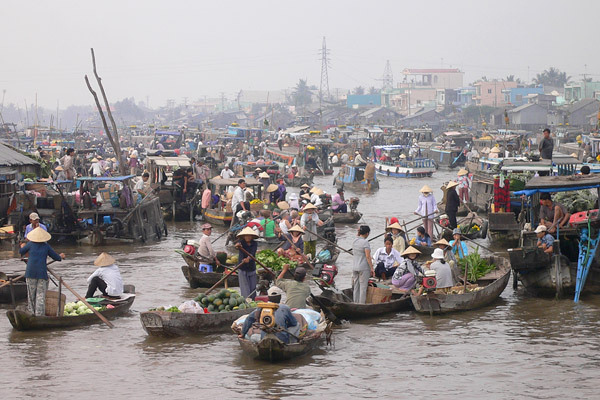 Consider the asian floating markets as a model. It is more a come together of all kind of floating structures in a business purpose than a "single rigid piece of designed engineering" in the sense of clubstead. There is no merit in a lengthy "design A versus design B" discussion - the design follows the function in the end. The wooden boat with the improvised outboard motor is a great design to take your melons to the market in asia. 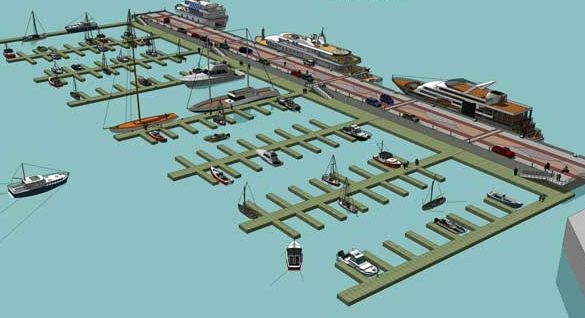 A big ramform could create a space in the stern section that host a calm water space where boats interact in form of a floating market. All depends on local needs and business opportunities. 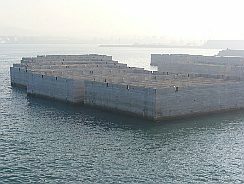 It features a protected stern harbor as suggested in the ice island - but other than the ice island it must be made of more suitable material - like concrete shell and concrete honeycomb construction techniques. The most simple way to overcome the problem of freak waves is submerging the structure. How about building something that can grow. I am thinking about the conch shell, the top part, turned upside down. It is a spiral. One could start out with a cellular concrete structure that grows in the shape of a spiral. 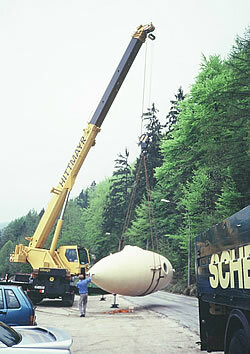 It would "grow" as it is added to in construction. I have seen videos of 3D constructed concrete houses. http://news.yahoo.com/blogs/sideshow/3d-printer-could-build-house-20-hours-224156687.html Perhaps the concrete cells could be built this way, using a giant 3D printing machine. It could build the bottom and wall of the cells with all of the rebar components, then fill the cells with foamed concrete, then seal them with the top layer, then start another layer of cells. So as the spiral gets larger and larger, forming an inverted cone shape, it sinks down deeper into the water. Perhaps the center could be filled with fresh water, creating ballast. At some point the cone shape can be flattened out to create more of a lilly pad form. This would start out small, but as it grew larger and larger it would become ever more resistant to waves. At some point is would become incredibly large. The advantage here would be that it is one large structure, a spiral "depth scraper". 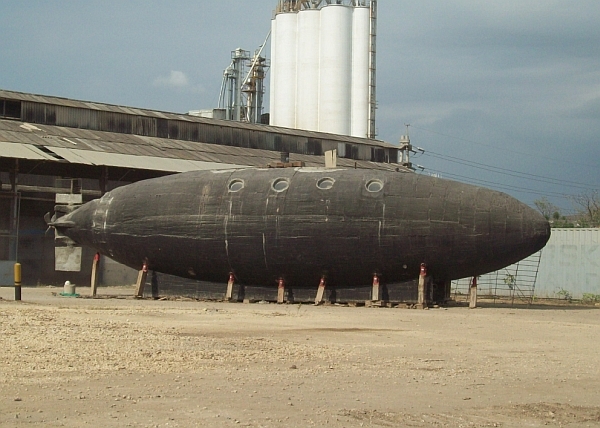 The material it is made out of is buoyant and can be tethered to the ocean floor , acting like a giant spar buoy. The electrical needs are rather small, and can be powered by on site wind turbines. 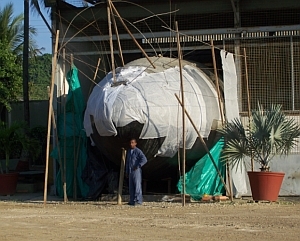 Foamed concrete floats could be encased in a wire or rebar mesh, then weighted down so they would float just below the surface. 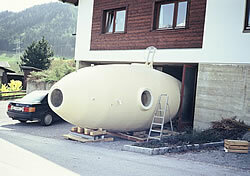 Once the accretion is finished one has a sturdy, buoyant platform. One could build a large lily pad type of structure. It could start out small but grow out in a spiral pattern, mimicking the form of a conch shell. This biorock is as strong as and even stronger than concrete and cracks can be "healed" by turning on the electricity again. I would think that in order to be very effective against waves, a breakwater would be better if it is actually an upside down cone, filled with seawater. The waves will then be dampened not only by the mass of the breakwater, but by the mass of the water inside. 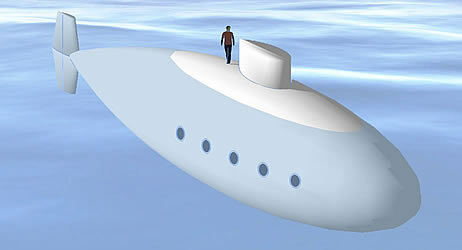 There is no doubth that there are hundreds of methods you can use to build someting that floats and breaks the waves. The key issue is that the structure must be big compared to the wave it breaks - as we know now oceanic waves (draupner wave) can reach 30m height which means that a 200 m ship is still quite small compared to it - as the example of the Bremen and the Caledonean Star - both hit by such waves - shows even a ship of that size will be burried completly by such a wave and be broken by the wave instead of breaking the wave. So for a effcient sea break you need to exceed the size of a huge ship considerably. To build it you need a awful amount of material - there is a good reason why rebar mesh and foam are only used in builds where the material quantity is low - nobody builds something out of foam meshwire and other composite materials that exceeds 10m size - it would just be too expensive and to tedious in material handling. Big structures like cities are never built out of "exotic materials" they are built out of concrete which is a relativly economic and easy handling material. Even so housing cost in City centers is more than average people can afford. Nobody could afford the squaremeter prices of a apartment built on a floating island of hundreds of thousands of tons of meshwire foam and biorock. 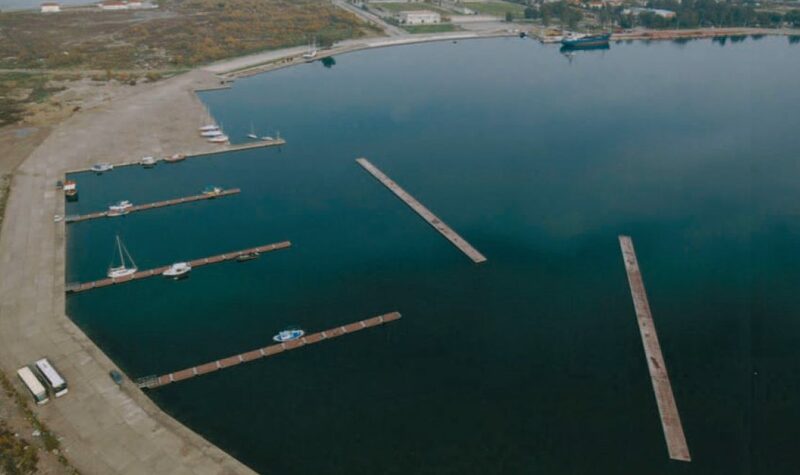 The key factor is / cost per ton / - if biorock would bring up a competitive figure breakwaters and harbor installations would be built out of biorock by now - it is out there for several decades. A good starting point would be to realize that people can afford living in concrete honeycomb and shell structures on land right now. 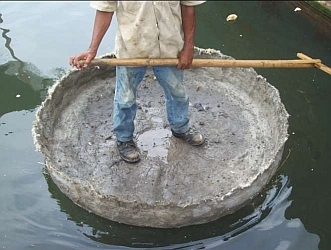 It is also clear that concrete honeycomb and shell structures can float maintenance free on the ocean for at least 200 years which gives them "real estate endurance quality" - on contrary to steel structures that will sink after a single decade of no maintenance. Evolution is always taking what is there right now and develop it a step further - so what we can expect in the next decade is that our coastal cities will grow out to sea in floating marina like developments - still using the same building materials usual right now - basicly concrete adapted to marine requirements. Oceanic headquarters for global business empires.